I've been wanting to write about the bag I won in the May giveaway for a while. Isn't it pretty? I won it from Julie at www.kundhi.com. I've been taking it with me to the pool in the mornings (while the boys have swim lessons)--it's the perfect size for a couple spare diapers, a book, a snack for my youngest, and my tiny purse fits in there too. 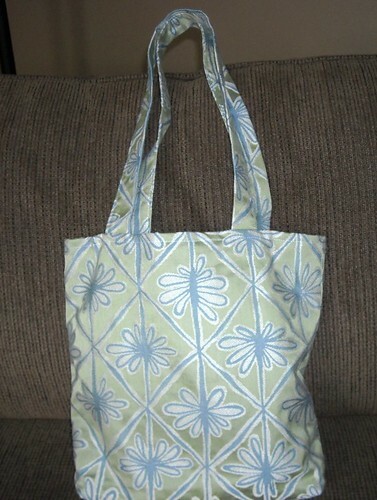 And today, my prize from Blogger's Quilt Festival came. I won a cute pincushion from Cindy at sewing on the edge. 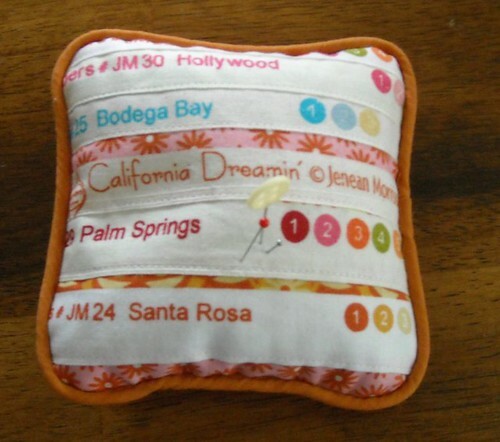 I got to pick one from her shop and I decided on California Dreamin'. The pincushion is filled with crushed walnut shells, and has a nice weight to it that my fiber-fill pincushions don't have. I love the piping around the edge. And yes, I'd love to go to California, but my sister and parents are making me jealous by telling me about their southern Utah adventures this week. It is killing me to hear about their hikes in Zion National Park--I wish I could go there soon! Also, this afternoon I finished up my potholders for the swap at our quilt guild tonight. They are Happy Camper hens (made from Moda Happy Campers fabric). I hope whoever gets them doesn't mind the machine stitched binding! While I was making them I was thinking about all the different fabrics that would make good chickens. I might need to make some more modern ones. Nice wins, Vicki! Pictures of your potholders didn't come through for me, but I bet they are adorable. those potholders are the cutest!!! love the bag and pincushion. walnut shells is a great idea. Thank you for the lovely pot holder! I was the fortunate one to receive one of these at the Guild exchange. You did a great job. They are adorable. And I love the quilting around the edges, especially the hearts! Did you do them free motion? And I was the fortunate one to receive the other (the red one)! :) I love all of the quilting (especially on the chicken itself) but my FAVORITE part is the comb! Thanks for making such a great potholder! I simply love your potholders, the choice of fabrics is perfect! thanks everyone! Julie and Nancy, I'm so glad you like them! Oh, I just love those chickens of yours! 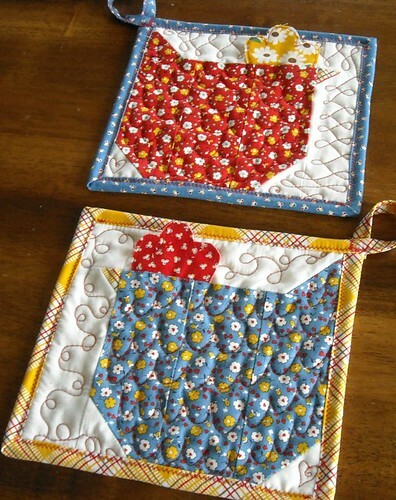 Super cute in the little quilt you did and awesome as pot holders! Very nice! Oh, and congrats on the win at the bloggers quilt festival. Nice pin cushion!